Stairways do more than just provide a way for us to get from one floor to the other. If placed properly, stairways can help the energy that exists in our home, called chi, to move up and down easily and smoothly. If stairways are not done well, they can inhibit the proper flow of energy throughout the home. Worse still, poor stairways can create problems or even harm us. How do your stairs stack up? Here are a few feng shui rules for stairways and the effect they have on you. Rule No. 1: No open risers. Stairs should be complete, whole stairs and always have risers (backing). Stairs with open risers lose flow and energy. Correct this by adding backs or risers to the stairs. This is especially problematic for home or apartments on the second floor. Effect: Second floor does not receive flow. Residents of second floor suffer. Rule No. 2: Where stairs stop matters. Stairs should not end at a door, such as the front door, or face a bedroom door. This creates poison arrows or killing chi (double that if a mirror reflects the staircase). If a staircase stops at a bedroom door, it can cause energy to drain away from the residents of the bedroom, causing financial and health-related problems related to low energy, such as low thyroid or depression. 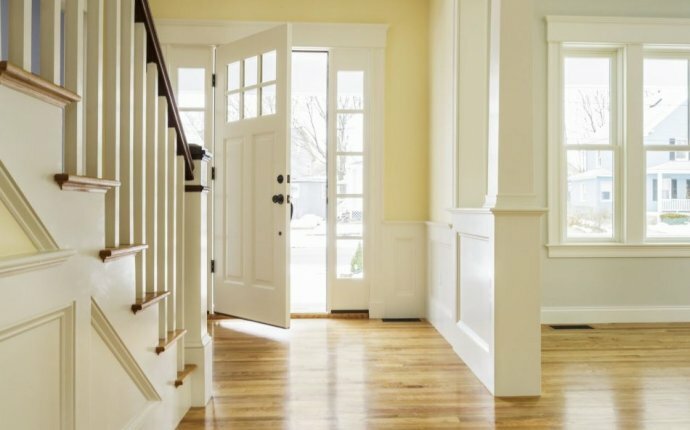 If your stairway terminates at the front door (like the picture at right), keep a bright light lit at the front door or in the foyer where the stairs are. This door should also have a covering over the glass to stop energy from running out of the house. Or, you can hang a crystal between the stairs and the front door. And if that doesn’t work for you, you can hang a small mirror at the back of the door to reflect the energy back up the stairs. These are all good and effective ways to combat this difficult placement. Effect: Loss of wealth, neck and head problems. Difficulties with opportunities for head of household. Rule No. 3: Staircase shape matters. Curved staircases are best. Spiral staircases, resembling corkscrews boring into a house, are the worst. They become even worse if they are placed in the center of the house or by the front door. Effect: Problems occur in the location of the staircase, i.e., staircase in center creates loss of wealth, and problems for all residents. Staircase in health sector creates problems for health. Rule No. 4: Split or scissor-style staircases create loss. Success in a household with a scissor staircase is elusive. This is doubled when a scissor staircase faces the front door (often seen in split level homes). Correct this by blocking the view of the staircase. Or wind a long strand of ivy (real or artificial) around the handrail from the upper stair to the lower stair. Place a plant at the top of the stairs or on the center of the stairs where it curves. Effect: Scissor styles create loss for patriarch or breadwinner and relationships suffer. Opportunities are lost. Rule No. 5: Staircase location is important. Staircases located on the side of the home rather than in the center are preferable. Stairs at the center of the home can cause a rift or split in the family. Block the view to this stair case if possible to reduce its effect.